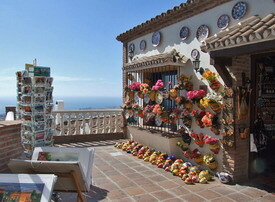 Mijas is located in the Spanish province of Malaga on the Costa del Sol in Andalucia. The town consists of two separate areas - Mijas Pueblo - a traditional Spanish white village - and Mijas Costa - a modern coastal beach resort. Mijas Costa is typical of all the Costa del Sol beach resorts with restaurants and bars near the beach. In this article we are concentrating on the beautiful Mijas Pueblo. Crown Resorts is a collection of apartment complexes consisting of white, low-rise buildings set in gardens with swimming pools and sports facilities, two kilometers from the beaches of the Costa del Sol. Guests can take advantage of the resort's full service heath spa, which features a heated indoor swimming pool, a jetted tub, sauna and a fully equipped gym, or enjoy a game of tennis or squash. Sun seekers can relax on the terraces around the large outdoor pool with a cool drink from the poolside bar and children are well catered for with their own pool, play area, video games room and mini club offering a full program of activities. El Porton is a Mediterranean-style hilltop apartment complex situated among the heights of Sitio de Calahonda in Mijas Costa, 15 kilometres from Fuengirola. Guests can soak up the sun in the garden, and enjoy a refreshing dip in the outdoor swimming pool. 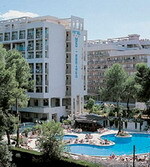 There is also complimentary use of all facilities at Club Marbella/Crown Resorts where guests check-in, two kilometres from the apartments, which include a fitness centre, squash court, indoor and outdoor swimming pools, bowls, miniclub, crèche, playground, games room and a bar with regular live entertainment. This three-floor complex features 38 apartments with simple, light decor and provincial pine furnishings. 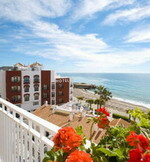 The hotel is situated 30km from Malaga airport in the heart of the Costa Del Sol, in Playa la Butibamba, Mijas Costa. Here there is something for everyone to do. Plenty of beautiful sandy beaches for the sun worshipers and plenty of watersports and activities for the more active. Bars and restaurants are plentiful. 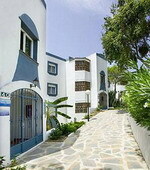 Situated on the beach, between Fuengirola and Marbella, approx 10kms from each. 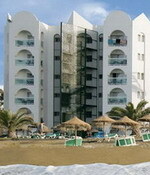 The hotel has a main swimming pool, gardens and a big terrace with bar Chiringuito with sunbeds and umbrellas. All-inclusive amenities and resort fees are determined by the property and are subject to change. 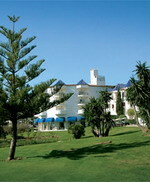 The Gran Hotel Guadalpin Byblos & Spa is located in Mijas, Spain, five kilometres from Fuengirola train station. It is 30 kilometres from Malaga and 35 kilometres from Marbella. This traditional white-washed Spanish complex features a spa centre with three swimming pools and a variety of beauty treatments. Internet access is available in public areas for a surcharge, and the hotel offers child care and supervised children's activities. The complex also includes its own nightclub. Gran Hotel Guadalpin Byblos & Spa houses a bar and three restaurants, La Fuente, Le Nailhac, and Byblos Andaluz, serving a variety of international dishes. 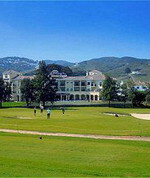 Two golf courses and four tennis courts are available on site. The hotel's 144 guestrooms feature Roman, Andalusian, and Arabian-style decor, and antique furnishings. The Hacienda Puerta del Sol is a modern hotel built in a typically Andalusian style, with archways and whitewashed walls, and is located on a hill overlooking the sea, four kilometres from the beach and the centre of Mijas Pueblo (village). Guests can enjoy a few sets on the two tennis courts, relax with a sauna and swim or tone up with a workout at the gym. A separate splash pool is provided for children. In the evenings, guests can unwind over drinks in the bar, and the restaurant offers a buffet of traditional Spanish and international dishes in an informal setting. Those wishing to check their e-mail can do so via complimentary internet access, and newspapers are provided free of charge in the lobby. Magestically located adjacent to Mijas Golf, situated in Mijas Costa, just 25 minutes from Malaga airport, Hotel Tamisa is the ideal place for a golfing holiday or a relaxing break. The beach at Fuengirola is only 5 minutes away and the picturesque white-washed village of Mijas a mere 15 minute drive. Enjoy in our air conditioned dining room or on our terrace overlooking the pool, golf course and the white village of Mijas with mouth-watering dishes prepared by our experienced chefs. During the summer months, dine in outdoor splendour on the terrace by the swimming pool. Have a drink in Bar Tamisa, the Salon Rojo or indulge yourself with a glass of bubbly or a freshly prepared cocktail on our Champagne Terrace. With a five star rating, Hotel La Cala is one of the top hotels in Spain. It commands a central position between the golf courses. Built in a traditional Andalusian style, it offers exquisite dining and entertainment to the discerning visitor. For just a quiet drink or nightcap you can relax in the Lobby Bar or if you wish to use the internet, look at satellite TV or play interactive games you can choose Bar Califa on the ground floor. The resort is the ideal base for enjoying your holiday. Just minutes from the coast and the towns of Mijas Costa, Marbella and Fuengirola, the estate is however totally removed from the bustle and hustle associated with the attractions of the coast. It is totally private allowing you to relax in one of our luxurious refurbished hotel rooms. Apartamentos Mediterraneo is a modern white Andalusian-style apartment block, located 200 metres from Torrecilla beach in the tourist town of Nerja, Spain. Guests can enjoy cocktails and sangria al fresco by the pool, and the informal, Andalusian-style restaurant and bar serves English and Spanish dishes including paella, Sunday roast dinners, and rice dishes. A children's menu is available. If it gets too hot outside, there are billiards, board games and games machines in the cool, tiled games room. Sports fans can catch the latest games thanks to the big screen TV in the lounge. The Apartamentos Marina Turquesa is a modern Mediterranean complex with a white façade situated within two kilometres of the beach and Nerja Centre. Guests can work out in the fully equipped fitness room, cool off in the indoor and outdoor swimming pools and enjoy some relaxation time in the garden or sauna. Nerja's historic caves are one and a half kilometres away, Frigilana is eight kilometres away and the water park is at a 20-kilometre distance. The 20 air-conditioned apartments have light modern decor with neutral coloured fabrics and light wood furnishings. All apartments open on to balconies with pool and garden views. Los Arcos is a modern four-floor hotel that opens on to terraces with sea and mountain views, and is situated one kilometre from Nerja Caves and the waterfalls of Playa Burriana. Guests can enjoy a complimentary continental breakfast in the dining room, or they can order from the menu (surcharge). Multilingual staff are available to advise on excursions around the local area, including trips to Granada, Seville and Malaga. Those wishing to spend a lazy day at the hotel can soak up some sun beside the pool while enjoying views of the sea and refreshing drinks from the poolside bar. The Braseria Iberica Restaurant is furnished in a traditional Spanish Style and serves local meat and fish specialities prepared 'A La Brasa' style on heated stones and hot coals, and accompanied by an extensive wine list. The Snack Bar Los Arcos has a friendly atmosphere and offers simple dishes such as sandwiches, pizzas, burgers and soups. The Hotel Nerja Club is located in Nerja, Spain, 800 metres from Burriana Beach. It is one kilometre from the Balcon de Europe promenade and three kilometres from the Caves of Nerja. Set in a residential area, this modern hotel features an outdoor swimming pool and each night offers live music. High speed internet is available in public areas and complimentary parking is offered on site. Complimentary breakfast is served each morning. The Restaurant Nerja Club serves international dishes and there is a poolside bar offering drinks and snacks. The Hotel Nerja Club has 108 airy guestrooms, all of which include direct-dial phones, cable TV, and air conditioning. The Marinas de Nerja Aparthotel is an appealing contemporary beachfront apartment hotel and spa, set two kilometres from Nerja and the Balcony of Europe headland. Guests have access to the spa and wellness and beauty centre with its indoor pool, jetted tub, sauna and Turkish bath. As well as the range of beauty treatments and therapies there's a Hamman, Scottish shower, foot bath and ice fountain. Outside, guests can soak up the sun by the pool or escape to the shade of the poolside bar for a cool drink or cocktail. Marinas de Nerja Aparthotel restaurant has an open kitchen offering a varied buffet, with cold and hot starters and an Italian corner with pizzas and pastas, in appealing contemporary surroundings. The 216 apartments have tiled floors with white walls and red and white furniture and fabrics and include air conditioning, cable TV, direct-dial phones and safes. The Parador is located on a cliff next to the sea, in a setting suitable for enjoying the coast, the beautiful natural spots of the area and the beach, which can be reached by means of an original lift. The entrance to the building has a splendid garden whose greenness contrasts with the blue of its swimming pool. The spacious and bright interior enjoys maximum comfort and includes elegant decorative elements. The bedrooms have spacious terraces with views of the sea. Hotel Perla Marina is a modern seafront hotel in the centre of Nerja, one kilometre from the famous Balcon de Europa with its breathtaking views and two kilometres from the water sports at Burriana Beach. 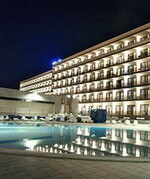 Guests can swim in the outdoor pool, unwind on the terrace sunbathing lawns, and relax over drinks in the hotel's bar. There is also a room service menu, and a café. 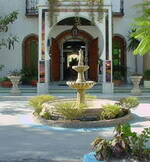 The Hotel Perla Marina's two restaurants serve continental breakfast and dinner buffets. The Rocamar poolside terrace bar serves snacks and light meals for lunch, with occasional live music. 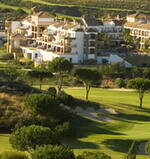 The surrounding area offers a wide variety of water sports, horse riding and golf.